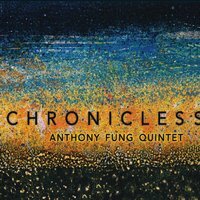 Drummer Anthony Fung puts together here an impressive collection of originals that have one foot in the tradition with the other foot marching into the future. He brings together a band of Edmar Colon/sax-perc, Mao Sone/tp-fh, Jonny Chapman/b and Kyumin Shim/p for seven songs and one four piece “Chronicles Suite.”Each song has many segues and facets to them,with Shims piano bringing in long intro to the eventual post bopping “Visitor,” while “If You Lieb Me Now”mixes chaotic and cataclysmic horns with Tyner-inspired piano chords. Sone’s horn is campfire warm on the ballad “Tony” and the horns all bop together on ”Allets.” Colon’s soprano is lithe on”Frienship” and moans on “Again” and as for the Suite, you get a catalogue of moods from plaintive to agitated, but eventually, the closing “Celebration” brings things to a festive close. Some strong composing and arranging is happening here, and these cats are up to it.